PROCYON is an inter-class cultural two day fiesta, wherein students of 16 different classes showcase their talents in various cultural activities on a common platform. The Chief Guest, Nadia Rebelo, a renowned Fadista and the Guest of Honour Sanket Mandrekar an artist by profession each wrote a message for the students at the venue. The Inaugural Function commenced with the Chief Guest, and the Guest of Honour watering a potted plant. 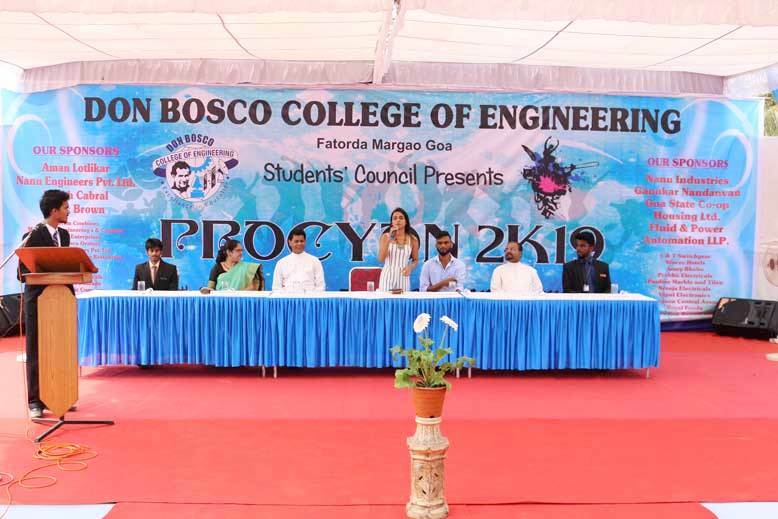 The Chief Guest then declared PROCYON 2019 open. In his address Fr Kinley D’Cruz conveyed his appreciation for a holistic all-round development of a student. He urged the gathering to encourage, respect, acknowledge and cheer for all the participants, not merely the winners. The Principal Dr Neena Panandikar thanked the cultural team, student council members and staff for the hard work put in to organising the event. In her address the Chief Guest encouraged the students to participate in all the activities and to put in their very best. She emphasized on living their dream and that success would follow naturally. She said that she was never a winner but it’s the failures that made her strong and triumph as a winner in the end. As a token of appreciation, the mementoes were presented to the the Chief Guest and the Guest of Honour. The Guest of Honour Sanket Mandrekar a very talented internationally acclaimed artist demonstrated superb showmanship with a portrait of Don Bosco. The Chief Guest enthralled the gathering with her voice. Several activities like Rhythm Of Tradition, Battle Of Bands, Step Up, T-Shirt Painting, Master Chef, Nukkad Natak, Snapper, The Voice, Skit, Rock The Ramp, Wealth Out Of Waste, Rangoli, Movie Making were held in the college campus. The department events had two professors who took part along with their students. The winners of PROCYON 2K19 were the students of B.E. MECHANICAL and the Runners Up were the students of T.E. MECHANICAL. They were awarded on the Annual cultural day at the hands of Chief Guest Mr. Jaideep Redkar and Director.